La vie is a glimpse into a treasure that disappears in the blink of an eye. not without fear, but with willing eyes. we should always remember to trust. Premieres this year at Dusk Dances 2014. Unquiet Winds was inspired by medieval Japanese and European love poems. Its creation employs principles of Japanese Butoh dance. First premiered at Dusk Dances 2013. Performed by Mairéad Filgate and Brodie Stevenson. Musicians: Blake Howard and Jesse Baird. Music Composed by Deb Sinha and Chris Wilson. and skill needed to maintain the highest level of accomplishment. and thrive in the glory of the sport. First premiered at Dusk Dances 1998. Performed by Miranda Liverpool, Natasha Phanor, Lua Shayenne and Shireeen Ali. Percussionists: Amadou Kienou and Philip Yetman. somewhere in Africa, that suffered from a severe drought. decide to embark on a great journey to gather water and plead to the Water Spirit. 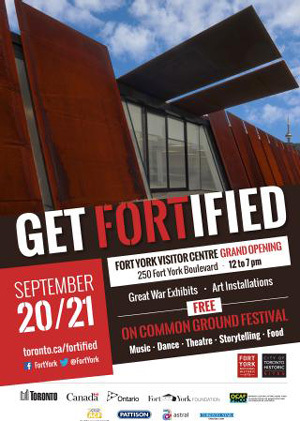 Fort York is located at 250 Fort York Boulevard (M5V 3K9), close to Bathurst Street and the Gardiner. The Streetcar 511 goes there!